Key Research Organization(s): Cal Data Ltd. The purpose of the project is to increase the number of ASTER (Advanced Spaceborne Thermal Emission and Reflection Radiometer) images available through the MapPlace to the exploration community in British Columbia. A number of ASTER based products have been developed and will be provided for all new imagery. Previous projects have made 138 ASTER images and derivative products available through the Image Analysis Toolkit (IAT) portion of the MapPlace. Significant regions and gaps between existing images remain unrepresented in this database. ASTER imagery with its 14 spectral bands and one back-looking band provide information in the visible, near infrared (VNIR), short wave infrared (SWIR) and thermal infrared (TIR) range of the electromagnetic spectrum as well as the ability to generate stereo images. New images will be orthorectified and atmospherically corrected and then added to the IAT for online image analysis by MapPlace users. The most recent good quality imagery with the maximum possible rock exposure will be selected. A number of derivative products will be provided for each image. Google Earth views of each ASTER image and associated Mineral Alteration Maps. Remote sensing images have been continually added to the MapPlace since 2003. The Image Analysis Toolbox (IAT) was created to utilize this data. Making use of such image data is new for many clients of the website. This manual is provided as an introduction to ASTER imagery and to assist users in navigating the toolbox. Portions of this manual are derived from three B.C. 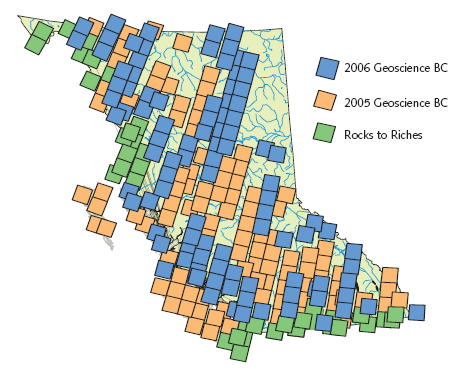 Geological Survey papers in Fieldwork: Kilby et al. (2004), Kilby (2005) and Kilby and Kilby (2006), and many other sources noted in the text or under References at the end of the manual. Advanced Spaceborne Thermal Emission and Reflection Radiometer (ASTER) is an imaging instrument flying on the Terra satellite, launched in late 1999. The instrument has 3 subsystems that capture readings from different portions of the electromagnetic spectrum at different resolutions. The three subsystems are referred to as VNIR (Visible and Near Infrared), SWIR (Shortwave Infrared) and TIR (Thermal Infrared). Reflectance values in the SWIR range are particularly useful in differentiating rock and soil mineralogy related to alteration zones. An ASTER image contains 14 bands of information, 4 bands in the VNIR with 15 metre resolution, 6 bands in the SWIR with 30 metre resolution and 5 bands in the TIR with 90 metre resolution. Two of the VNIR bands sample the same wavelength range but one is back-looking providing the ability to generate a stereo view of the scene. A single ASTER scene covers an area of about 60 by 60 kilometres. The ASTER web site is an excellent source of information on the instrument, its mission, available imagery, usage examples and analysis tools. The “Image Analysis Toolbox” project developed and implemented an image analysis capability for the MapPlace and was delivered by Cal Data Ltd. The Toolbox is a framework in which a variety of multi and hyperspectral imagery can be added and processed online by end users. The results of the analysis are georeferenced and can be completely integrated with the information already contained in the MapPlace. The suite of analysis tools in the IAT was added to the Exploration Assistant page of the MapPlace. The appearance and operation of the IAT was designed to maintain the general look and feel of the Exploration Assistant. The purpose of the Toolbox is to provide the ability for MapPlace users to experiment with a variety of imagery and analysis procedures in their search for exploration targets.